I have to check my docs, but I think only the Koch could run the EL34’s and the 6550‘s. Eden had a cooperation with Koch. Most part is indeed a Koch K2500, but I think the preamp had bigger differences. Just read the following on a 'for sale' site - is this true? "The Eden VT series were designed and made in Holland by Koch when Eden first decided they needed a line of valve amps. The models a, b and c were all basically the same amp but with small tweaks made throughout the production. This particular model a is more﻿﻿﻿ like the model b with different jacks from earlier a’s and a tweaked back panel. Koch designed and built these amps in Holland with all the same components they used on the Koch branded amps. Interestingly the design, build and components for the Eden VT300 and Sadowsky SA200 are only separated by two differences. The Sadowsky only uses EL34’s where the Eden will run both 34’s and 6550’s making it switchable from 200 to 300 watts. The other difference is a slightly different voiced preamp. Saving £1k for more headroom and more footswitchable options isn’t bad." Eden General / Re: WTDI issue ? Could be a problem with the Gain pot or the first OP amp. I would change them first. 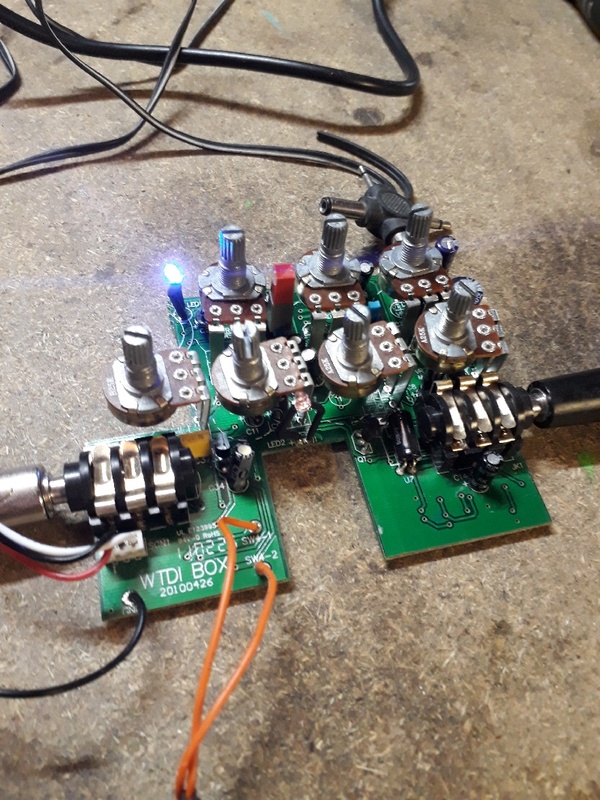 Yes, weirdly, jacks are deep-plugged in, leaving a little gap between the connector and the embase of the jacks..
Actually, when I switch off the bypass (red light is then off and the preamp is on) I can hear a very low signal lost in the hum when I turn the gain knob all the way up.. I can also notice tone change when I fiddle with the eq knobs, but that's all..
is your plug all the way in? Eden General / WTDI issue ? Feel free to move my topic if I'm in the wrong section.. I'm struggling with my WTDI which is malfunctioning. I can turn it on, the blue led is on but I'm getting no signal at all. I then decided to open it up and try to figure out whether I could see any burnt component or blown-up capacitors with no success so far. Before I throw it away, I wondered if you guys would have some clues or ideas to test/check.. I thank you a lot ! The River City Party Band (rivercitypartyband.us) will be bringing out our dance sets this weekend at Enzo’s in Centerville Va Saturday. Outstanding food and plenty of space to hoof it!